Cheyenne SOL Luna: Unparalleled work experience with innovative SENSIDRIVE® technology! The SOL Luna is a very suitable machine for me working with smaller needle groups, lining strong but also having the SensiDrive® option for smooth and detailed shading. It’s a perfect development of the earlier systems from Cheyenne that makes perfect sens. The strength and the stroke of the motor is very similar to HAWK Spirits, but now the SOL Luna not only supports running at low speed, there is also more give, which makes coloring a lot easier. Because of the adjustable hard and SensiDrive®, it expands the versatility to match different tattooing behaviors, and lets artists work with fine lines and layering with greater ease. The Cheyenne SOL Luna sets a new standard for tattoo machines: An incomparable new work experience awaits you thanks to the innovative SensiDrive® technology! The SOL Luna lets you control the motor through different settings, while remaining powerful and gentle on the skin. The result is an extremely clear tattoo, reduced pain during use, as well as a faster healing process. 2.5mm stroke length make the SOL Luna the leading tattoo device for soft transitions and shading, with realistic colors as well as black & grey work. The Cheyenne tattoo machine operates from 25 Hertz in the low-frequency range and can be set to up to 150 Hertz. The SOL Luna provides you a smooth and quiet workflow with low vibrations. Our valuable anodization process makes sure that you can clean the tattoo machine easily and safely for a hygienic practice. 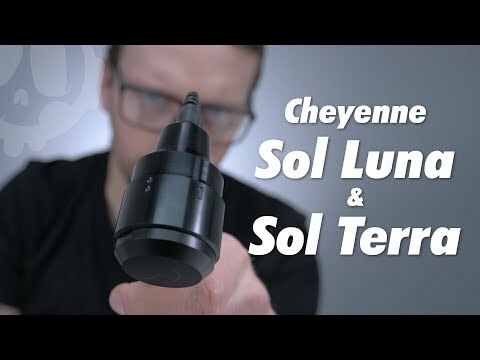 Of course, the classic Cheyenne hand piece as well as our safety - a craft needle modules are the best additions to your set-up, so you can use the SOL Luna in the best possible conditions. All Cheyenne power packs with an output power starting at 20 amps are compatible with the SOL Luna, for reliable control of the machine. Cheyenne SOL Luna: welcome to a new dimension of tattooing – Manufactured in Berlin!